NOTE: Dates indicated are not confirmed. Once the event organizers confirm the dates, we will update the website. It is that time of year again to provide paddlers the opportunity to take advantage of the Early Bird Specials for the 2019 year. The Houston Heat Board has made the decision to maintain the same membership rates as the last few years. For the 2019 year, the annual membership rate is $200. There is a one-time $20 Administrative Charge for brand new members. EARLY BIRD SPECIAL: For a limited time, Houston Heat is offering an Early Bird Special Discount if you submit your dues by January 31, 2019 with a completed and signed membership form to the Houston Heat PO BOX (address is listed in the form) – Memberships will be $175.00 for returning members and $185.00 for brand new members (50% off of the one-time admin charge). You can submit a check to the PO Box or submit payment via QuickPay with Zelle to houstonheatdragonboat@gmail.com. Don’t delay. This discount will end at midnight on January 31, 2019. Your check/Quickpay and form must be post marked and delivered by this date. Please visit the Houston Heat Join Our Team page to learn more about how to become a member. You can also download the membership form and read the Houston Heat Code of Conduct at this page. Attention ALL youths ages 14 – 17! 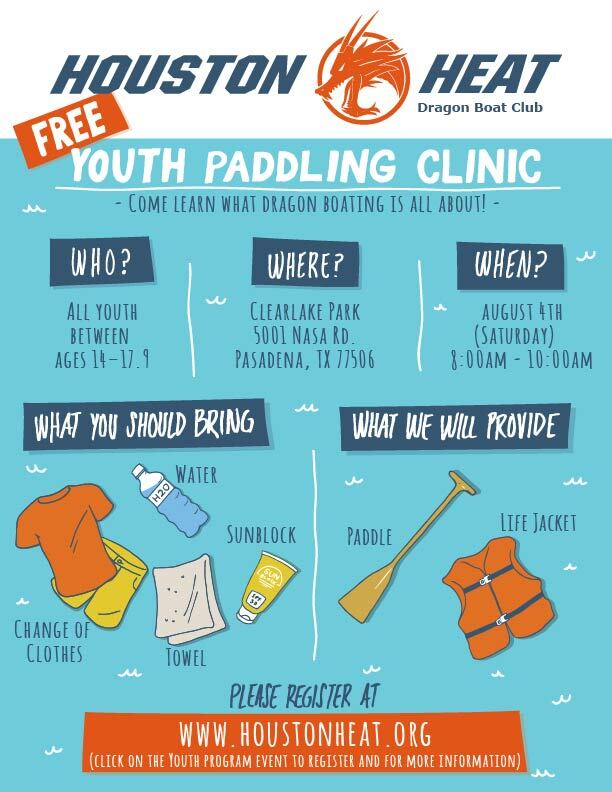 Houston Heat Dragon Boat Club is holding a free paddling clinic on Saturday, August 4th at Clear Lake Park (Mud Lake side), on Clear Lake Park Road, Seabrook, TX 77586. The nearest address is: 5001 NASA Rd, Seabrook TX 77586. Meet and register promptly at 8:30 am and spend one hour on the water paddling with other friends, family or teammates around the same age. 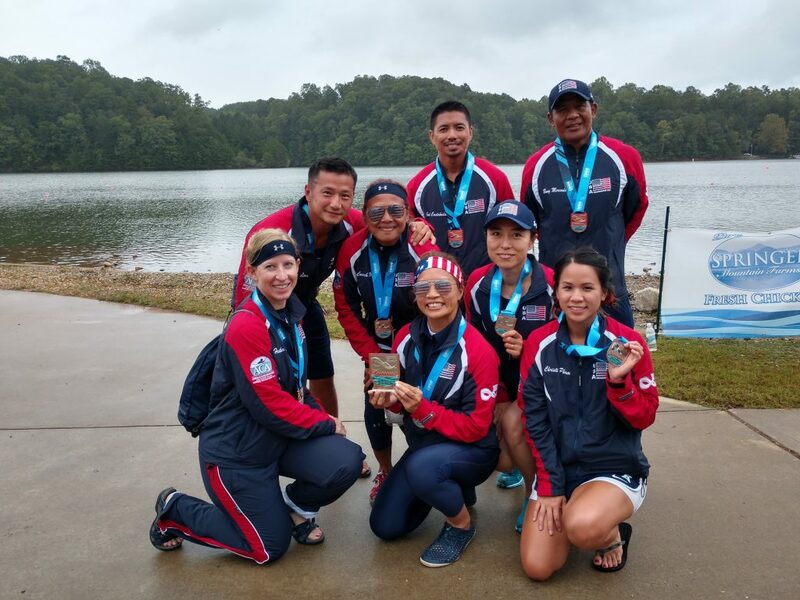 Houston Heat is an established year-round dragon boat club and has experienced coaches to train and steer you through an exciting, fun filled session. Paddles and personal floatation devices are supplied, but bring sunblock and plenty of fluids. Dress accordingly for a water sport. 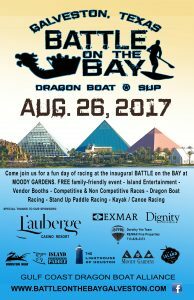 Come learn first hand the ultimate team building sport, where every seat plays an important role in which boat gets to the finish line first. Practice Registration section will have the sign up soon. Please check back at the end of June. Sign up and look forward to some paddling fun! 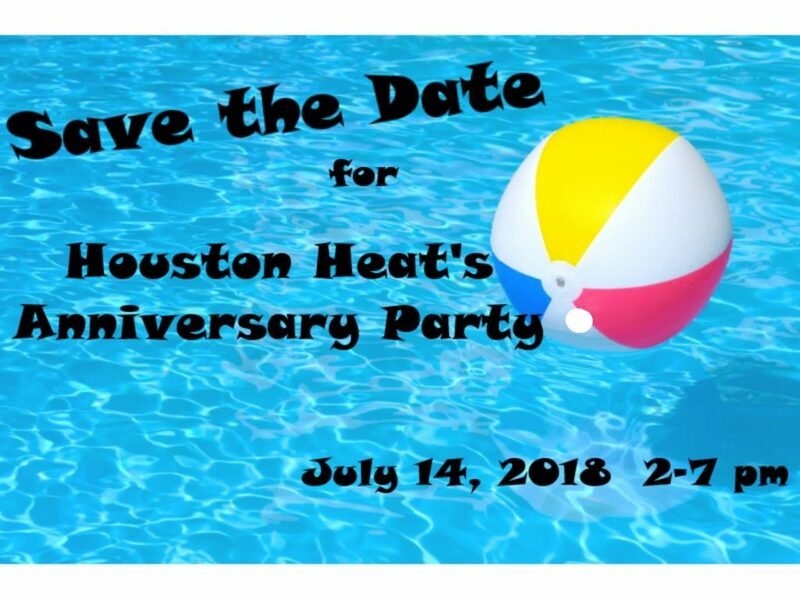 Save the date: July 14, 2018 (2pm-7pm) for Houston Heat’s Anniversary Party. More information will be provided soon. It is that time of year again to provide paddlers the opportunity to take advantage of the Early Bird Specials for the 2018 year. The Houston Heat Board has made the decision to maintain the same membership rates as the last few years. For the 2018 year, the annual membership rate is $200. There is a one-time $20 Administrative Charge for brand new members. EARLY BIRD SPECIAL: For a limited time, Houston Heat is offering an Early Bird Special Discount if you submit your dues by January 31, 2018 with a completed and signed membership form to the Houston Heat PO BOX (address is listed in the form) – Memberships will be $175.00 for returning members and $185.00 for brand new members (50% off of the one-time admin charge). Don’t delay. This discount will end at midnight on January 31, 2018. Your check and form must be post marked and delivered by this date. Please visit the Houston Heat Join Our Team page to learn more about how to become a member. You can also download the membership form and read the Houston Heat Code of Conduct at this page. 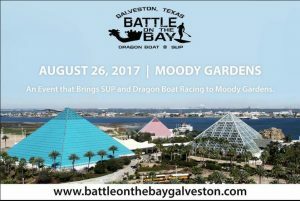 We want to give a big thanks to all of our sponsors who are helping us make this Battle on the Bay event happen! Interested in being a part of this? Contact us for sponsorship opportunities! 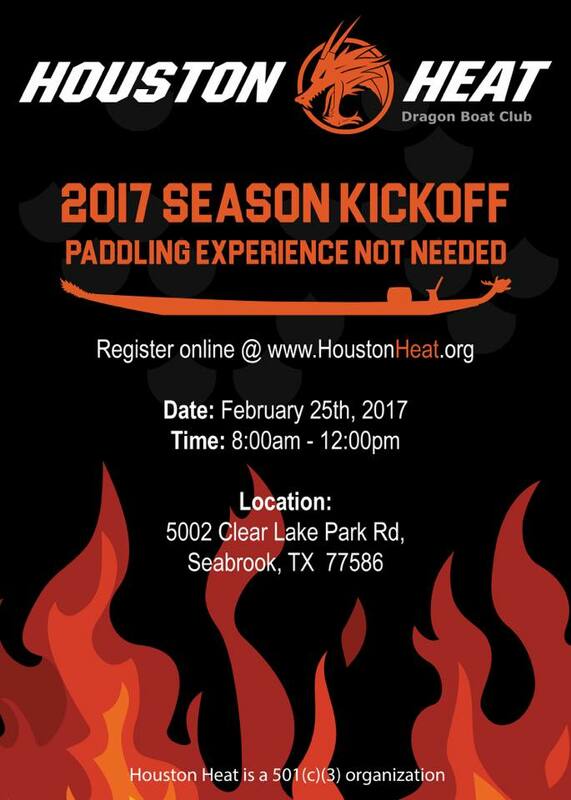 The 2017 Houston Heat Kick-Off is around the corner. Save the Date: Saturday, February 25th. Sign up above and come on out.